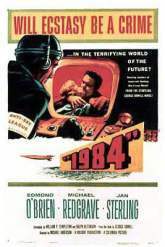 Based on George Orwell's novel about a futuristic, state-run society controlled by "Big Brother", in which love is outlawed. Employee of the state, Winston Smith (Edmond O'Brien), falls for Julia (Jan Sterling), but is then tortured and brainwashed for his crime. Also with Donald Pleasence.